Included in PRO update 1.1.2 (Dec. 8th, 2015) and FREE version 1.5.4. Most pictures are from Unsplash (view license). View an Unsplash Collection of Potential Images. Starting in 1.5 of the FREE and 1.1 of the PRO version of the weather widget you can use different background images based on the current weather displayed. There are two ways to handle this functionality, one is through images in your a folder called awe-backgrounds found in your theme folder and the other is by using the new CSS classes (found lower on this page) attached to each widget. The basic difference between the CSS and Images approach is that with CSS you can target images that don’t live in your theme folder. Note: Turning this on will initiate the series of checks performed to find the images. Turning this on and not using it will result in extra processing every time your widget is loaded. 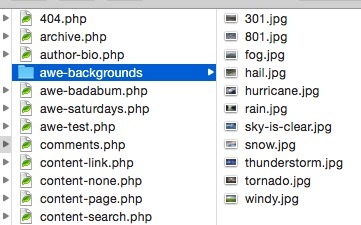 Create a folder in your theme called awe-backgrounds. In this folder you will create jpg images (this can be changed) with specific names that directly link to the weather code or description. 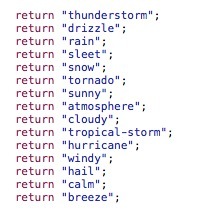 Because there are for instance 10 different codes for rain, you could simply create a rain.jpg and it will be used for all those codes. This will give you a base for the rain section. Then you can go back and add stuff like 511.jpg which would be freezing rain. That is pretty much it for the background by weather images. You can set the main Background Image in the widget settings as a fallback image if nothing is found.